It’s not often you see a singer or musician involved with two different albums from two different bands being released within a month of each other, but that’s exactly the case for famed vocalist Fabio Lione, who has certainly been very busy in recent years, since leaving Rhapsody of Fire. Earlier this month, he released a collaborative effort with Alessandro Conti, and now his current main band Angra are set to release their ninth full-length release, ØMNI, this coming February. I’ve had my struggles with Angra in the past, not enjoying their first couple of albums much at all and even finding most albums with Edu Falaschi to be solid but forgettable, outside of career high point Temple of Shadows, but I had hoped they would finally win me over with Fabio joining the band, as he’s by far my favorite of their three singers. Unfortunately, their previous album Secret Garden didn’t do much for me, so I had just about written the band off until I received the promo for ØMNI. 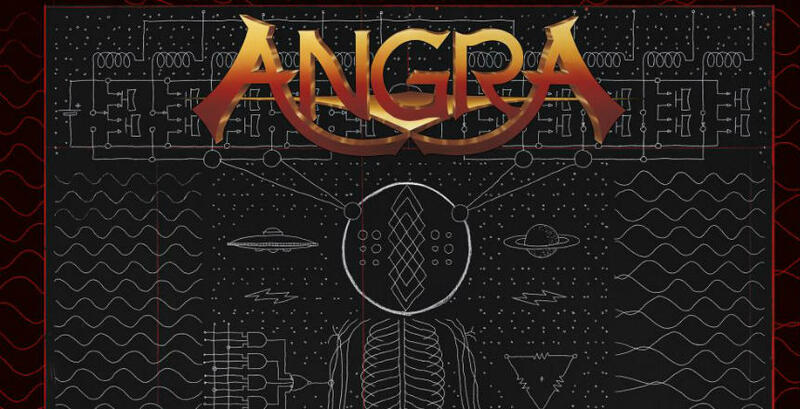 Even then, I had my doubts after a couple of listens, but after giving it some more time, I have to say, this is the first time the band has truly impressed me outside of Temple of Shadows, and while it may not quite reach the heights of that masterpiece, it’s definitely a great album that can stand alongside it as by far my two favorite Angra releases to date. While Angra is generally described as a power metal band, they stand out from most bands in the genre by having very diverse songwriting and by including some unexpected elements, such as a unique kind of percussion they include on many of their albums, as well as some very unique melodies. Their songs often stay in a more relaxed tempo than many power metal bands, and while this can work out well, I generally find their albums lack a lot of energy, which was especially a problem with Secret Garden, an album which I thought had some huge highs, but far too many lulls for my tastes. With ØMNI, the band really hasn’t changed much, as the percussion is definitely in full effect on some tracks, the melodies are certainly unique and a bit bizarre at points and the songwriting is certainly varied, with many softer sections, but overall it definitely packs more of a punch than its predecessor, with the heavier sections really standing out in a positive way, giving the album a much-needed energy boost. Compared to Secret Garden, the prog elements are fully intact, and if anything this release has some much more complex compositions as well as even more technically impressive musicianship, occasionally reaching close to Dream Theater levels, and of course the symphonic elements still appear from time to time. The biggest difference is that where the previous album had shockingly little power metal compared to other Angra albums, this album has about the amount listeners would expect, with three full tracks of speedy power metal and many speedy bursts found on other songs. The songwriting is quite varied, as ever, and while the second half definitely is softer and slower paced, on the whole, there are enough heavier sections to keep it engaging this time around. Obviously, performances are strong all across the board and the production is flawless as always. It’s also worth noting that this is a concept album, based around a futuristic setting in the year 2046, though personally, I don’t find the lyrics to be either a selling point or a negative: They’re just kinda there. One thing that’s definitely a selling point for me is vocalist Fabio Lione, who has to be the most prolific power metal vocalist in the world at this point. Seriously, it’s getting hard to find bands in the genre he hasn’t been involved in at least some way or another at this point. Regardless of how active he is, though, his voice still sounds as strong as ever, carrying the melodies perfectly as always and bringing in some extra power to enhance the heavier tracks. He gives an emotional performance that really lifts one particular track I’d probably find a bit lacking him and simply does an outstanding job all around. There’s also help from guitarist Rafael Bittencourt on a few tracks, as with Secret Garden, and he does a solid job, though I definitely prefer Fabio’s vocals over his. There are also some guest vocals on one track, which I’ll describe a bit further, but needless to say, they’re a real treat. Moving on to songwriting, which tends to be my biggest problem area with most Angra albums, but this time around that isn’t the case. Opening track “Light of Transcendence” is a blazing fast symphonic power metal track with uplifting melodies, wonderful guitar work, a super catchy chorus, heavy riffs and an excellent guitar solo in the second half. It’s an amazing track that really got my hopes up for the entire album the first time I heard it. Next is lead single “Travelers of Time”, which is a pretty interesting track. It starts off with some of that percussion I described earlier as well as some very heavy, almost djent like riffs which carry on throughout the verses, but then as the chorus hits the track goes full speed away and becomes another epic, speedy power metal track that’s sure to please fans of the genre, with Fabio delivering some amazing vocals as always. The track gets heavier again later on and Rafael delivers some of his best vocals, which lead to a pretty memorable guitar solo, followed by an even more epic final run through of the chorus. Between this track and the opener, fans are treated to one heck of an awesome one-two punch to start the album. After that strong start, we get one of the more bizarre and interesting tracks in “Black Widow’s Web”, which opens up with some very soft but quirky and kind of unsettling female vocals, which are very effective in setting the mood for what turns out to be a dark, heavy and very intense track. It’s more mid-paced compared to the first two tracks, though it does speed up at points, and it has a memorable chorus. The most notable feature of the track, though, aside from the uncharacteristically heavy, and again almost djent like riffs, is the inclusion of some very powerful and intense death growls, which show up frequently during the verses and chorus. Later on, there’s a section where the music gets even crazier and heavier, with the death growls being the sole focus. I’m sure some folks may be turned off by this track, but I find it to be one of the best on the album, and it’s certainly something I wouldn’t have expected from Angra. After that, the album settles down somewhat. Next is “Insania”, another more mid-paced and progressive track, which still has some heavier sections, though it’s much calmer and melodic compared to the previous track, with its speedy and fun chorus being its best feature. It’s another epic track, with a nice use of symphonic elements, interesting drum patterns, great vocal melodies and some of that classic power metal feeling in the chorus. Following that is the first ballad, “The Bottom of My Soul”, which is led by Rafael. It’s a solid track in its own right, with a nice chorus and a nice use of symphonic elements, as well as an epic guitar solo later on, but I find it to be the weakest on the album overall. The pace picks up again after that, though, with “War Horns” being another fast-paced power metal track, falling somewhere in between the heavier “Travelers of Time” and the more melodic “Light of Transcendence”. It has some punchy guitar work, strong vocals, and another catchy chorus, as well as occasional voiceovers, which thankfully don’t distract much from the music. Definitely another one of my favorites on the album. Perhaps the biggest oddball on the album and one that took several listens for me to fully appreciate, is next, that being “Caveman”. It starts out with some odd rhythms, more of that djent influenced guitar work, and it features some of that unique percussion as well as some very odd chanting. 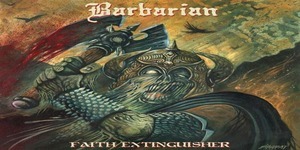 Initially, I wasn’t really feeling the track and thought it was a big misfire, but over time I’ve come to appreciate the early parts as an interesting experiment and then after a while Fabio takes over and track becomes more melodic before eventually speeding up and delivering an epic power metal chorus. The instrumental section in the second half is very interesting and has a lot going on, and overall it’s certainly an interesting and very progressive track, which has actually become of my favorites over time, though I can see it being hit and miss for some folks. One thing’s for sure, though: That chorus is incredible, and easily the best on the entire album. Moving into the last few tracks, the pace drops off a bit. Next is “Magic Mirror”, probably the most progressive track on the album, and one that brings Dream Theater to mind at times, with some of the complex guitar work in the second half, as well as the chorus. It also has a slight touch of retro prog rock during some of its softer moments, and it’s a pretty calm and melodic track overall, though it has one explosive heavy section in the middle, where the pace picks up. It’s definitely a very complex and engaging track, that shows how much the band has evolved over the years. After that is “Always More”, the second ballad, and while it starts off feeling a bit boring, with verses sung decently by Rafael, once Fabio jumps in to sing the chorus the track really picks up, as he delivers a very emotional performance that lifts the track to new heights. The final run through the chorus, in particular, is incredible and really enhances the song. The last full metal song is next, with the first part of the title track “Infinite Nothing.” It’s another progressive, mostly mid-paced track which has some great instrumental work, especially from the guitars, and of course, Fabio does an amazing job on vocals as always, delivering another emotional chorus. It’s a bit calmer than I’d expect for an epic length track, but it has quite a few memorable sections and is a great track overall. Lastly, we have “Infinite Nothing”, the second part of the title track and an orchestral piece containing melodies from all the previous tracks on the album. It’s a nice way to close the album and definitely brings Temple of Shadows to mind. Overall, ØMNI is a pleasant surprise, being the second Angra album that has fully impressed me, and it comes right after their previous album left me feeling quite disappointed. It features the usual trademarks of the band, while also including some much heavier guitar work than expected at times, as well as some extremely varied and effective songwriting that helps lift it up to greater heights than most of their other albums. I expect longtime fans to be divided on it, but I’d highly recommend it to fans of power metal and prog who want a more varied and challenging album to listen to, as well as for anyone who can’t get enough of Fabio Lione.